6/9/2017 Update!! And our little Hopkins gets adopted!!! A dog with his own "story" finds a home where he can encourage others with their own "story." Hopkins will serve as a therapy dog where he can provide inspiration, unconditional love, and encourage others that have experienced hardship in their life. He will make hospital visits and bring a smile to injured children. 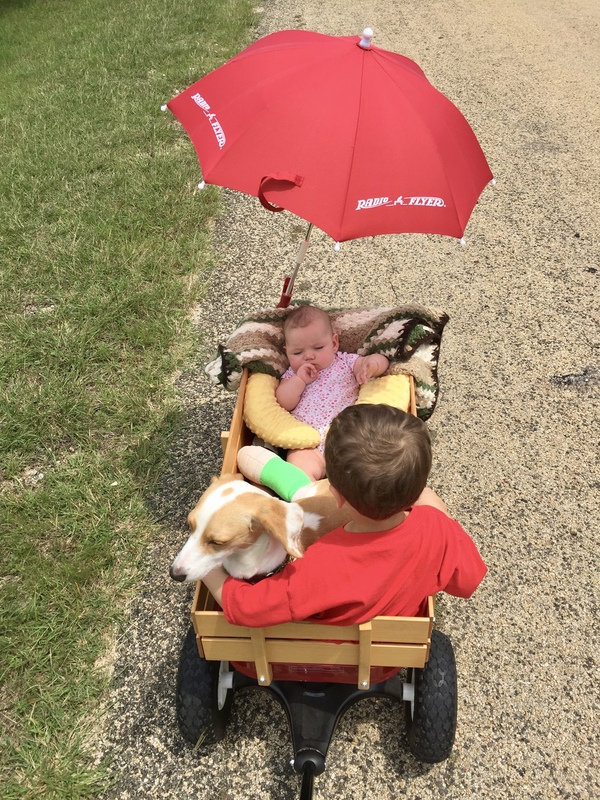 Just check him out in the red wagon- picture tells all. Thank you to his family that drove hours from Killeen to adopt Hopkins and to Dr. Israel for piecing him back together. 6/1/2017 Update!! Hopkins had his first bandage change and is healing beautifully! He is definitely on the road to recovery! Thank you to all who have supported this little dude! 5/26/2017 Update!!! Little Hopkins made it through his surgery with flying colors. He had an implant placed in his shattered tibia and reconstruction of the ligaments. In addition to the fracture, poor guy had a pretty nasty open wound that is being treated with antibiotics. Despite all this, Hopkins is making himself quite at home in his foster home- exploring the pool, basking in the sunny outdoors, and convalescing on the leather couch in between potty breaks. Hopkins will require weekly bandage changes but given his age and quality vet care he received from Dr. Sarah Israel at STVS - we expect him to make a full recovery. Hopkins was roaming the streets for awhile and found himself in a spot of trouble. Poor Hopkins came upon a group of larger dogs and unfortunately, he was fighting a losing battle. Hopkins walked away from it with multiple puncture wounds and a fractured tibia; though that hasn't broken his spirit! Sweet Hopkins still walks up to every dog wanting them to be his best friend. Hopkins has undergone surgery and is set to make a full recovery. Of course, that does not come without a cost. If you are able to donate towards Hopkin's medical care, we would greatly appreciate it. Every little bit makes a difference.